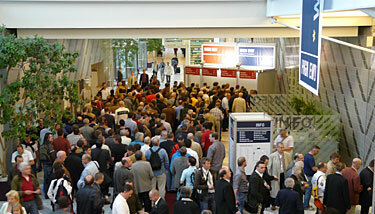 Seen here is the crowd just as the show was going to open for the first public day. This is a very small sampling, as those here were waiting to buy tickets, while those with tickets did not need to wait in line and could simply go into the exhibition space. 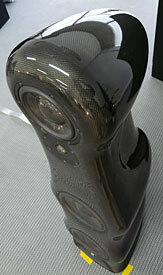 Driver manufacturer Morel had their carbon fiber driver and cabinet Fat Lady ($32,000). Named Fat Lady after the famous saying "it's not over till the fat lady sings". The cabinet is constructed from an outer layer of lacquered carbon fiber, optimally mixed with fiberglass and epoxy resin. The result is an enclosure that is extremely strong, yet light. 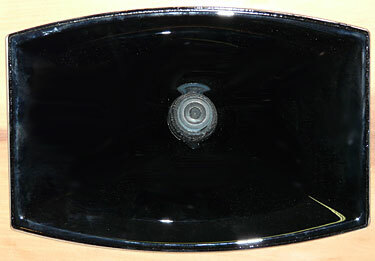 The curved form, with no straight lines, resembles a musical instrument, and unlike conventional speaker systems, has no internal damping at all. Morel's R&D team worked diligently to design, develop and fine tune the drive units specifically for the Fat Lady and include a Supreme 28mm tweeter, 6-inch midrange unit features Morel's famous 3-inch underhung EVC (external voice coil) and a pair of 9-inch bass units with 3-inch EVC. Listen to the sound of my voice... as the Brutale hornspeaker (95,000�) by Blumenhorfer Acoustics. While this is a world premiere, the design is not yet fully measured and they expect about a 102dB/Wm into 8 Ohm sensitivity. Drivers are a modified compression tweeter, TAD midrange and 21-inch custom driver. It has a very linear impedance curve so can easily be driven and coherent phase as well. Amphion had their Prio 610 two-way monitor and Impact 550 self-powered 500-watt subwoofer with variable crossover (2700� and 2790� respectively). True Life Audio had a world premiere of their Reference amplifier (150,000�) that produces 140 watts with zero negative feedback. 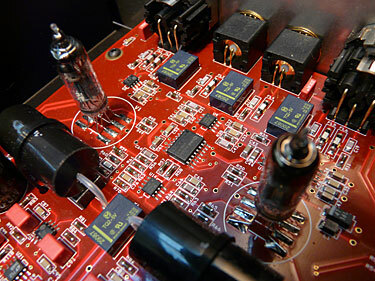 Supporting tubes are an 833 output, 300B as driver and 6C45 first gain stage. 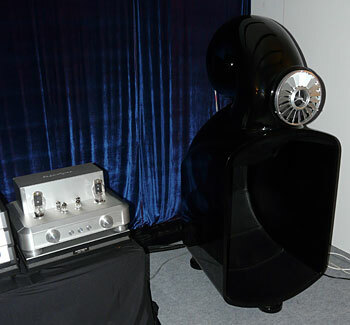 Get ready with lots of friends as this sweet amplifier weighs 150 kg (that is 330 lbs to you yanks). Everything is hand wired, nano-crystal secondary wiring is copper and primary winding is silver. There are a total of nine transformers, three being for power, two interstage, one for output and three for choke duty. There are no capacitors in the signal path. Award-winning manufacturer Trends Audio had their line of products here in Munich including their PA-10 tubed headphone amplifier/preamplifier. Enjoy the Music.com has reviewed and awarded Trends Audio for the product excellence. 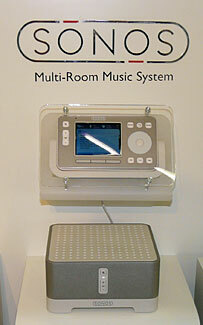 My personal fave homewide music distribution system, Sonos, was here in Munich. See my review by clicking here. Business is doing great for German turntable and cartridge manufacturer Clearaudio and their new Concept will retail for only 998�. 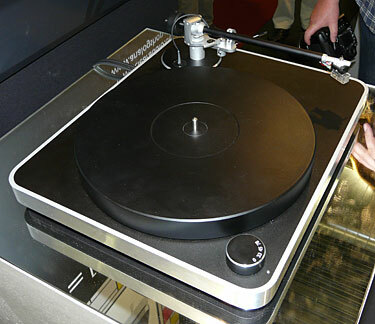 It includes tonearm and Clearaudio MM cartridge PLUS it plays 33.3, 45 and 78 rpm discs! The cartridge comes preinstalled so this package is literally plug and play! My vote for best integrated amplifier, the Silbatone Acoustics, now has their new Reference 300 integrated amplifier (35,000�) and Aporia hornspeakers (36,000�). 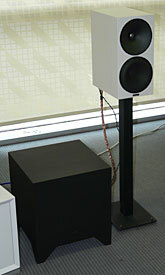 The new Reference 300 has been further refined than the unit i personally raved over. The refinements include extensive use of Litz silver wire, super rare Bendix 6900 driver tube, and exclusive semi-silver foil output transformer. Yeah, there is more and yeah, my mouth is watering and yeah i want to review it. Dali has their special edition Motif LCR (469�) with two 4-inch drivers and 1-inch soft dome. Audio Aero was premiering their La Source SACD/CD player (27,000�), which can also be used strictly as a transport. 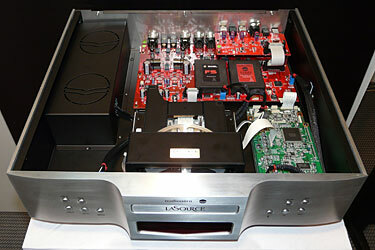 It uses the TEAC Esoteric VRDS-NEO/VM transport that is optimized for high speed disc rotation. The DAC boards are plated with 24 karat gold and 70 ppm copper to ensure optimum signal flow. Naturally a reference unit such as this has multiple DAC chipsets, for each channel, and can easily handle the company's S.T.A.R.S. Evolution 32-bit DSP/384kHz engine. Jitter is stated to be a low 1ps RMS. A very wide range of digital inputs and outputs, including USB, lus analog outputs of both balanced and unbalanced. 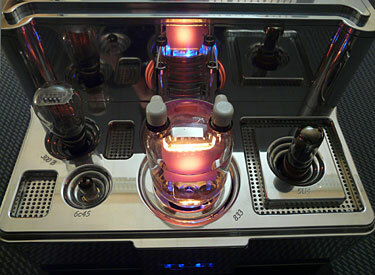 The tube in the Audio Aero La Source is one per channel 6021W JAN Phillips. The tube has been cryogenically-treated.